ABC Family (which rebrands as Freeform January 12) announced the first three episodes of new drama Recovery Road are now available on WATCH ABC Family app, Hulu, and Video on Demand, until the series premiere. The first episode, “Blackout,” will also be available as a free digital download on iTunes, Amazon Video, and Google Play. Watch two new previews, below. Based on the YA novel by Blake Nelson, Recovery Road focuses on a teenage girl, Maddie (Jessica Sula), living with addiction. In addition to Sula, the cast includes Sebastian De Souza, Sharon Leal, Alexis Carra, Kyla Pratt, Daniel Franzese, and David Witts. The show debuts Monday, January 25, at 9:00pm ET/PT on Freeform. 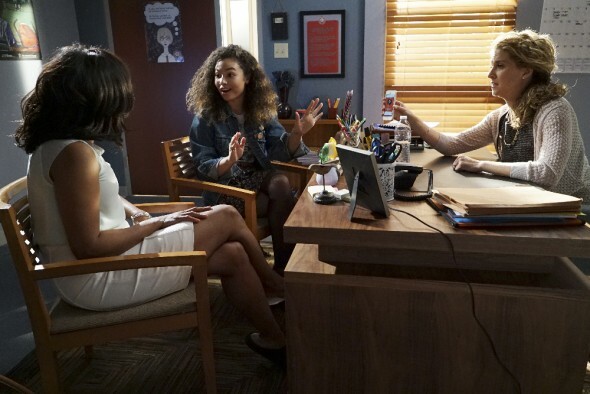 Burbank, CA (December 15, 2015) – When Maddie gets busted for possessing alcohol at school, she’s forced to choose between expulsion and rehab in the series premiere of “Recovery Road,” airing Monday, January 25th at 9:00 PM ET/PT on Freeform, the new name for ABC Family. ABC Family is becoming Freeform on January 12, 2016. When her high school guidance counselor confronts Maddie about the severity of the situation, Maddie can’t see the problem with her hard-partying ways. Forced to face facts, Maddie makes the difficult decision to live with other recovering addicts at a sober living facility at night. She’s determined to keep it all a secret from her peers as she continues her regular high school routine by day. The premiere episode, titled “Blackout,” was written by Bert V. Royal and Karen DiConcetto and directed by Lawrence Trilling. Based on the popular young adult novel by Blake Nelson, “Recovery Road” stars Jessica Sula (“Skins”) as Maddie, Sebastian de Souza (“The Borgias”), Sharon Leal (“Dreamgirls”), Alexis Carra (“Mixology”), Daniel Franzese (“Mean Girls”), Kyla Pratt (“Dr. Doolittle”), and David Witts (“EastEnders”). The pilot was written by Bert V. Royal (“Easy A”) and Karen DiConcetto (“Ruby & The Rockits”) who will also serve as executive producers alongside Holly Sorenson (“Make It or Break It”), Danielle VonZerneck (“Left to Die”), and Craig Piligian (“Abducted: The Carlina White Story”), and Beth Miller (“Revenge of the Bridesmaids”) from Pilgrim Studios. Part of the Disney/ABC Television Group, ABC Family (to be renamed Freeform on January 12, 2016) is distributed in 94 million homes. The network connects to audiences and goes beyond entertainment with bold original programming and immersive social engagement. The network delivers a unique mix of quality original and acquired series, plus fan favorite movies and the holiday events “13 Nights of Halloween” and “25 Days of Christmas”. WATCH ABC Family (also to be renamed Freeform) is a service which allows viewers with participating TV subscription services access to 24/7 live viewing of the network, as well as continued on-demand access via a wide array of devices. Have you watched the latest previews for the Recovery Road TV show? Do you plan to watch the first three episodes, ahead of the premiere? Tell us. More about: Freeform TV shows: canceled or renewed?, Recovery Road, Recovery Road: canceled or renewed? I love recovery road so mulch it is a great show that a lot of people can relate to because it is centered around a very real topic: addiction. It is also educational too if you think about it. The television show shows us all the negative effects of addiction and it’s effects on the addicts family as well. Please do not cancel this show!!! I love this show is the best thing since true blood that i can relate too and i really love the story line i hope this was not the last episode of the season. I love this show so much and please dont cancel it. Please don’t cancel this show it’s different and very good. Finally a show that is not the Kardashians or reality of the rich. I love this show even though I am 38 years old and dealing with a drug issue myself so this show helps a lot. I really looked forward to this show. Please do not cancel this show like every other show I fell in love..
Love this show please don’t cancel this show it is so amazing and realistic I look forward to Mondays just to watch Recovery Road! I watched all the released episodes and OMG… I love all of them. I can’t wait untill the next episodes! BTW: I think Cynthia and Greg are going to end up together. I watched the first episode on the ABC Spark Facebook page via a sponsored ad. Loved it! Really want to watch the next two episodes, but can’t find a link that works in Canada!! I’m sorry, Sara. If I find a Canadian link, I will post it in this comment thread. I watched the first three episodes of Recovery Road in one sitting. As a newly recovering alcoholic, I could relate to Maddie and the people in the house so much. Words of wisdom the characters have each other were advice that has been given to me numerous times before. Very realistic. The characters are so loveable! I can’t wait to see more!! Thank you for reading, Lauren, and thank you especially for sharing your journey with us. Best wishes to you.